Social Media is similar to Pandora’s Box. It holds powerful tools which can help boost your business to new customers, retain loyal ones, and help to engage online within the digital world, or if can be a ton of wasted resources if not used properly. Along with anything new comes a lot of misconceptions. Although you maybe questioning the most efficient ways to maximize social media with your audience, don’t give up! Here are three major myths I come across which I’d like to take a stab at debunking. Social media outlets are fast paced and constantly changing. Content gets posted online, flooded, pushed down, and becomes irrelevant quickly and before you know it. Although this may seem like a wasted effort it reminds us that it’s important to repost the same content in different ways to best represent your brand. Getting creative and thinking of interesting and exciting ways to share your content while avoiding making it seem too repetitive is important. People often miss things, forget them, and if it’s evergreen content, then it’s always useful. Putting a new spin and angle on how you repost it will help it live long and prosper. One of my favorite tools is pablo by buffer or canva, both can help quickly create visual content to accompany your content, and did I mention they’re both FREE. Remember, the human brain processes images 60,000 times faster than text (click to tweet this) so visual content within social media is a MUST if you want to stand out and drive engagement! Although your content should be targeted around your industry and demographic to best optimize, don’t be afraid to show personality. Behind your brand you’ve got REAL people following you and engaging online. Even if it doesn’t directly relate to your brand, product, or service spreading some humor can help to humanize your brand’s message. We’ve found quotes, funny gifs, and office photos and interesting news articles helpful at CFA Institute. Have a little fun, let your hair down, and get creative with your social media posts! Contrary to what you believe, the older crowd is quite active on social media. 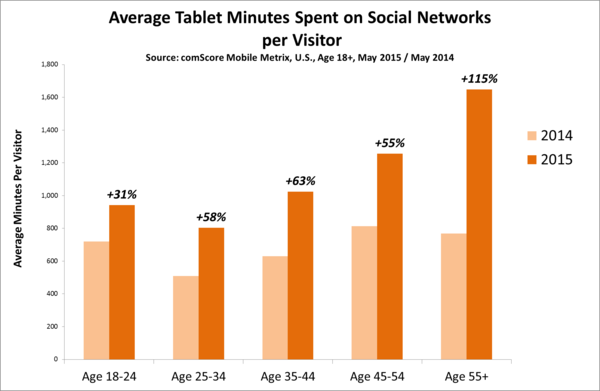 According to comScore Mobile Matrix the average tablet minutes spent on social networks per visitor is up 115% from 2015 in the 55+ age bracket. According to FastCompany the fastest growing demographic on twitter is the 55-64 year age bracket (click to tweet this). This demographic has grown 79% since 2012. For Facebook this group has jumped 46%, for Google+ 56%. Not broadening your brand to reach an older age group, or ignoring their presence on social media outlets will severely limit your company’s potential for growth. What do you think of these three myths debunked? Would love to hear your thoughts, leave a comment below or send me a tweet, thanks!